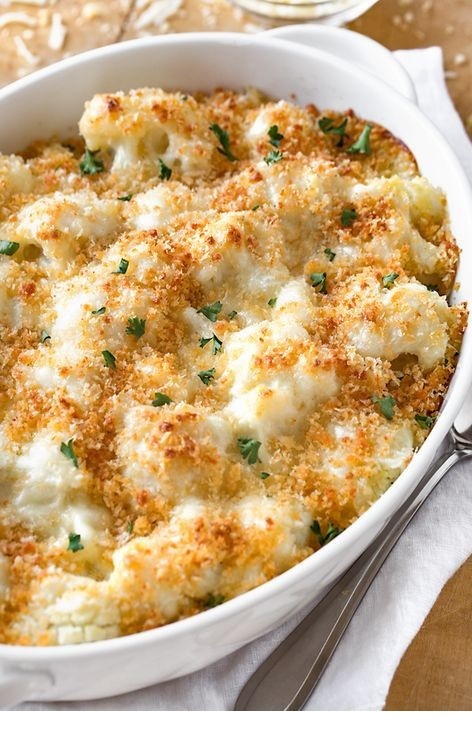 This creamy and delicious cauliflower casserole with a crisp panko and parmesan topping is a scrumptious way to turn cauliflower into a cheesy side dish! Preheat the oven to 375° and have medium-large baking dish ready on hand. To prepare the parmesan sauce place a medium-sized pot over medium heat; add in 2 1/2 tablespoons of the butter, and once it has melted, add in the garlic, and stir until aromatic. Sprinkle in the flour evenly, and stir to create a roux, or a paste-like consistency; then, pour in the milk, whisking all the while to avoid lumps.